She’s absolutely right, but the memo hits only on the budgetary half of why compositional balance is important. Accepting on face value that the 113th Congress will pursue more deficit reduction measures (more forthcoming from us on this premise)—at the very least replacing sequestration in chunks or entirety—including progressive revenue is critical for minimizing the economic drag of austerity. 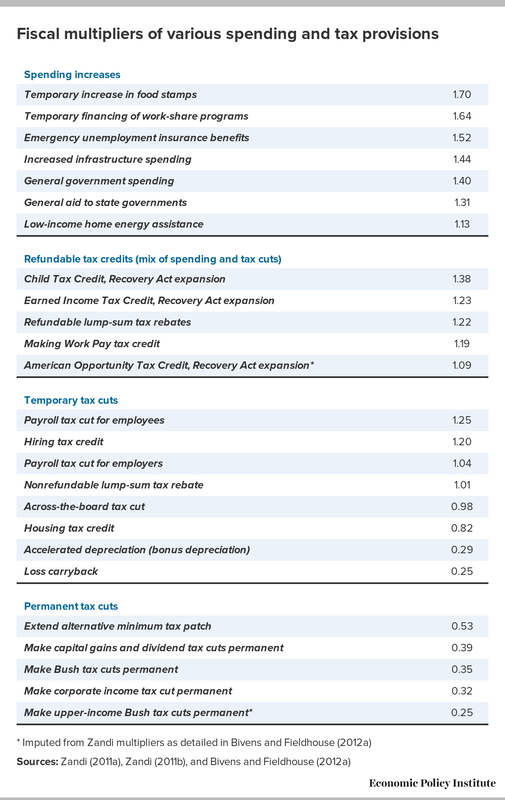 As we’ve explained before, revenue increases on upper-income households and corporations are, per dollar, the least economically damaging policy option for deficit reduction—see the table below. (Again, why policymakers are abandoning what works and fixating on damaging an economy already depressed nearly $1 trillion—or 5.6 percent below potential output—with bleak prospects for emerging from depression, is a question for another post.) Some simple math helps underscore the benefit of increasing the revenue share in hitting a fixed deficit reduction target. In other words, balanced deficit reduction is critical not just for protecting the basic functioning of government, social insurance (Medicare, Medicaid, and Social Security), public investment, and more broadly the progressivity of the tax and transfer system—it’s critical for minimizing the economic damage of the premature austerity that Congress misguidedly remains hell-bent on enacting. In a sane world, the sequester would simply be repealed without offsets—which would still leave real GDP growth in the ballpark of an anemic, inadequate 1.6 percent for 2013—and deficit-financed spending would be used to boost demand and ensure a return to full employment. We previously estimated that $700 billion of deficit-financed spending would be needed in 2013 and sustained for several years to return full employment—the equivalent of roughly three more Recovery Acts. But given the misguided obsession with austerity at hand, maximizing the share of progressive revenue in expected subsequent deficit reduction measures is a decent second-best option. To that extent, Murray’s emphasis on balance and progressive revenue is encouraging, albeit from a very low bar in economic policy management. 1. As a side note, it’s important to remember that the Affordable Care Act enacted in the 111th Congress was perhaps the most substantial piece of deficit reduction in decades, lowering the projected deficit in the decade following conventional 10-year budget windows by more than $1 trillion and prompting massive downward revisions to long-run projections of public debt. Note that we use Moody’s Analytics Chief Economist Mark Zandi’s fiscal multipliers, which have the advantage of being policy specific, but are robust to estimates by CBO, the Council of Economic Advisers, and the International Monetary Fund, among others (see my colleague Josh Bivens’ blog post for more on robustness of multipliers).